Winifred Frick and Paul Heady Monitoring Pallid Bats in Rancho Las Parras. 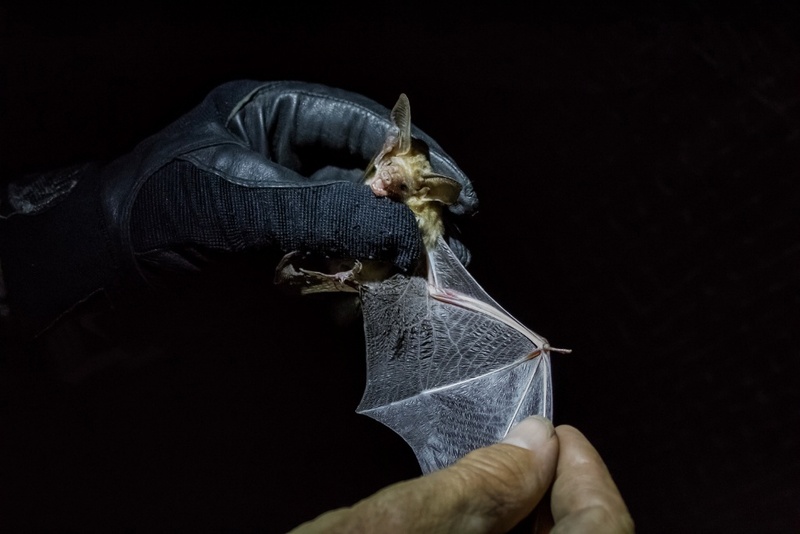 It was Monday, April 9, and at 6:30 p.m., we again accompanied the team of Paul Heady and Winifred Frick, this time we moved to “Rancho Las Parras” to carry out a monitoring of Pallid Bats again. After a Mexican gastronomic delight among friends at the “Taqueria Los Poblanos”, Quentin Frick, Uncle Winifred, the professional photographer Richard Jackson, Tom Haglund expert on birds and other species and the talented Filmmaker Johnny Friday, we drive approximately 30 minutes and 28 km by road to the southwest of Loreto, going into the mountain heights of “La Giganta” at about 450 m. above sea level, to reach the site called “Rancho Las Parras” characterized at first glance by a small chapel on the roadside, but downhill from the ranch, a small stream embraced by a green and lush oasis, the combination of sound of the water eroding the rocks and the singing of different birds were therapeutic for the ears, a perfect place to achieve the goal of Paul and Winifred, who would arrive minutes after us. Already installed in the ranch, the Winifred team began with the installation of their work team in strategic areas along the small Oasis, within the team we met two young professionals recently graduated in this specialty, who worked at all times in the installation of the networks in an arduous and always very friendly way, providing information despite their activities, they were Matt and Grenger. After the installation of soft nets which would allow us to have these small mammals in our hands, it was time to wait, the team divided into 3 different places where there were networks waiting for the moment to get lucky with some capture and start the work of monitoring There we were, sitting at the edge of the oasis and waiting, in silence and taking advantage of observing the milky way that filtered through a roof of silhouettes of palm trees, waiting to hear someone of the team saying “We captured one”. It was exciting! After about 40 minutes of waiting, who would think that “We have one” would become “We have another” repeating again and again for more than 5 times during the starry night, monitoring had begun, we had the first pale bat, was in the hands of Winifred, delicately held it to show us more closely this species, it was obvious, we were excited and wanting to scratch his little head with our index finger, I realized that we all agreed on something, because the only words They came out of all of us were “It’s so Cute”. Each small mammal was delicately taken in the hands of the experts, we only admired and photographed them, while they annotated them, measured them, weighed them and marked them, a great monitoring work was taking place that night in one of the three networks placed between mesquite trees inside the ranch, while in the other two networks, it seemed that there was not much luck, in one of these unlucky networks, I was accompanied by Quentin, both with a pleasant talk about their experiences with bats, we did not let the impatience will approach us and while the light of the lantern passed over the pastures that surrounded the stream, the brightness of hundreds of eyes betrayed that we were not alone in that network, we were surrounded by hundreds of small arachnids along these pastures, where finally, in the game of this light, we could observe how a small pale bat went straight to the net right in front of us It was great that moment, because not only did we have the opportunity to observe how these networks worked, I also had the opportunity to observe Quentin’s skills to untangle that mammal, the net was supported by two metal tubes, each on one side, so they left the net flying over the river, the bat was almost half the network, Quentin, was with the tip of both feet on the slippery shore and with 90 degrees of his body bent forward with arms outstretched in its entirety, practically half of its body was on the river trying to remove the small mammal that did not stop moving entangled in a thin and soft black network in the dark, for about 8 minutes, the cunning, experience and of course An admired balance was enough for Quentin to release this child, who minutes later went through the monitoring process at the hands of Winifred. Great Job Quentin! During the monitoring process, specifically at the end, in the liberation of the bats, another story was lived, while Richard Jackson was hands full with incredible photographs, freezing bats taking flight to their freedom from the hands of experts and while Johnny Friday observed in detail all this monitoring process next to Paul, the intrepid Tom Haglund accompanied by Darwin, son of Winifred, they were dedicated to collect scorpions, which they gave to the bats to see their behavior when devouring them and I do not know, but also in a way as a reward for the stress they might experience during the monitoring process, after a while and every time that Tom appeared, he appeared with a scorpion in his hands, again and again, noting the ease with which that brought the scorpions, I decided to take a look at the time of collecting them and know what was the successful technique of finding them in the middle of the obscure, to our surprise, they had flashlights of ultraviolet light, investigating a little, if you do not know, all scorpions emit a “cyan” fluorescence when they are illuminated with ultraviolet light. This phenomenon was discovered in 1954 and revolutionized the study of the biology and ecology of scorpions thanks to the fact that it was possible to locate them and observe them at night using black light lamps. How easy! This monitoring of pale bats was incredible and we could experience the mixture of specific techniques to perform it, the skills, knowledge and abilities of these experts, in which we never noticed boredom and on the contrary, always with sympathy sharing with us everything, absolutely everything, in order to always maintain our spirit and initiative for the conservation of these incredible environments that are vital for the different species that inhabit our region of Loreto. There is no more to say, they have done a great job and when you read this article, you will feel the same emotion with which it was written and with that we want to transport you to this place and to this event that not every day to which we can be partakers.